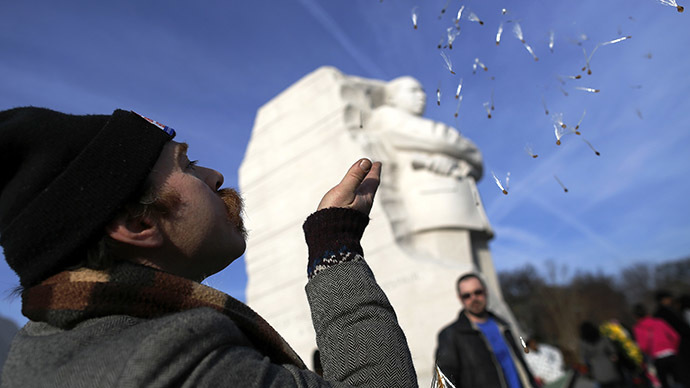 ​Thousands of Americans are marching across the country on Monday in honor of slain civil rights leader Dr. Martin Luther King, Jr.
Traffic reached a standstill in metropolitan hubs including Washington, D.C. and New York City on Monday during annual holiday demonstrations during which the legacy of MLK is preserved by activists and sympathizers aiming to expand civil liberties. Demonstrators aligned themselves with Dr. King, the African-American Atlanta-born pastor who died from an assassin’s bullet in 1968. The message from the protesters was that fifty years on the issues of discrimination persist. Protesters paid tribute to unarmed black teen Michael Brown, who was killed by a white officer in Ferguson, Missouri, and Eric Garner, who died during his arrest in Staten Island, New York. At Harris-Stowe State University in St. Louis, protesters interrupted an MLK ceremony by taking the stage at the auditorium unannounced, reportedly in anger over the death of Brown, and forcing the ceremony to temporarily grind to a halt, the St. Louis Post-Dispatch reported. Attendees left the auditorium in anger, accusing the demonstrators of being disrespectful. In some places, activists also staged die-ins to commemorate Brown's life. Television host Oprah Winfrey and pop singer John Legend rallied alongside thousands of others on Monday in Selma, Alabama – the southern city that famously served as starting point for the 54-mile civil rights march attended by King in 1965. Stars of the motion picture “Selma,” a historical drama based on the march that opened in theaters across the United States earlier this month, joined Winfrey, Legend and others during Monday’s event in the motion picture’s namesake. United States Rep. William Clay, a St. Louis Democrat, evoked last year’s controversial officer-involved shooting in nearby Ferguson, Missouri in advocating for change during Monday’s event when speaking to Fox News. Thousands of others were reportedly participating in similar marches on Monday this week in cities including Sacramento, California, Boston, Massachusetts and San Antonio, Texas, according to local media reports. “This is everyone's struggle,” Ghada Ghannam, a 20-year-old University of Texas at San Antonio student originally from Egypt, told journalists at the city’s Express-News paper. “Regardless of where they're from."